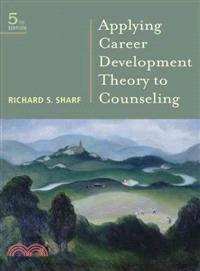 A must-read for practicing counselors and counselors-in-training, APPLYING CAREER DEVELOPMENT THEORY TO COUNSELING demonstrates how to apply principles of career development in a counseling setting! Highly praised for its clear writing style, useful case examples and diversity coverage, Sharf strikes the ideal balance between theory and application. The book's companion Web site reinforces key concepts with discussion questions, tutorial quizzes, and relevant links.